Hello, and welcome to this thread. 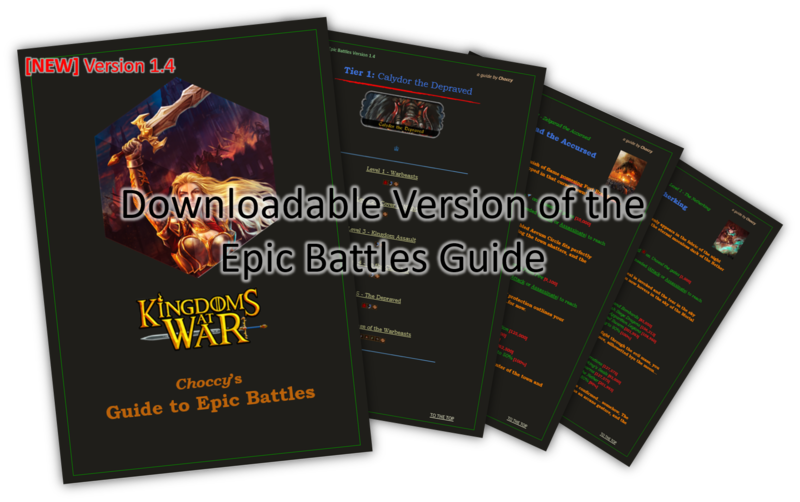 A downloadable guide of the Epic Battles Guide have been made, because multiple people have been requesting it. The guide is now done, but feel free to come with suggestions, feedback and questions either in this forum thread or on my wall. Thanks! If you want to view/download the guide, click on the Download button below. 1. Hold down the Download link above and the Open|Copy dialogue box will appear. 2. Select "Copy" (or open if u want to take a quick peek). 3. Exit KaW app and open Safari. 4. Paste copied link in Safari address box and Go. 1. Click on the Download button above. 2. Click option "Download" and save to device. [Version 1.4] Feb 19, 2018 - Redesigned Table of Contents. The epic battles Zelgarad the Accursed and The Netherking were added to the guide, along with other small bug fixes. [Version 1.3] Sep 8, 2016 - A new front page, and the colors in the guide was changed. The guide was updated with info about the Labyrinth of Zoma epic battle, along with other small bug fixes. Sep 1, 2016 - The epic battle The Labyrinth of Zoma was added to the guide. Aug 3, 2016 - The epic battle Ghomorax of the Highlands was added to the guide. Dec 28, 2015 - Guide updated. Dec 12, 2015 - Minor bug fixes, and The Viper's Den's Blood Rains time and plunder bonus spell were added. Nov 17, 2015 - Small bug fixes. [Version 1.2] Nov 11, 2015 - Blood Rains Epic Battles with completion time and plunder bonus spell information, and some small bug fixes. Oct 9, 2015 - All information has been added for all epic battles. Sep 15, 2015 - Small bug fixes. Sep 24, 2015 - Small bug fixes. Jul 11, 2015 - Small bug fixes. [Version 1.1] Jul 8, 2015 - A new way of displaying epic battle drops was added. Font sizes and headlines were changed, along with other small bug fixes. Jul 4, 2015 - All epic battles at that time have been added. Jul 2, 2015 - All epic battles up to Desert Sting were added. New images added, and other small mistake and bug fixes. Jun 29, 2015 - All epic battles up to Haunting: The Escape were added. [Version 1.0] Jun 23, 2015 - Initial release. If you are not able to download the guide, please tell me and I will see what I can do. Thanks! Last edited by Choccy on Feb 19 2018, 4:27am, edited 38 times in total. Sincerely, the guy that just tricked you into downloading malware. Crazy wrote: Sincerely, the guy that just tricked you into downloading malware. No malware. But the guide only goes to The Awakening for now. Wish the links to the Eb's worked in the Pdf. It might just be my pdf viewer. I think it is just your pdf viewer, cause the links work on mine. Try to download the Dropbox app and see if it works then. More epic battles will be added later! Thank you, sas. I really appreciate it! Try to download the Dropbox app and see if it works! Last edited by Choccy on Jul 6 2015, 1:55pm, edited 1 time in total. Once again, good work @Chocolate! Looking forward to your next project.